You are right to point out the 'HOLES' similarities, they remind me of that 'HOLES' @ Pentagon. Apparently the No of US personnel wounded was 294 instead of the widely circulated '174'. This is what happens when you're goverment has been hijacked by a nation of bigots, racists, false flag experts and mass murderers. 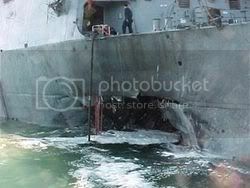 I realise this response is a little late to the party, being almost 15 years after the attack on the USS Cole, however there are some interesting facts that have been left out or overlooked. The USS Cole was not the first ship to go to Aden to refuel, it had been done several times by several different ships (USS The Sullivans, USS Hawes, USS Donald Cook to name three). Refueling in a foreign port is a common practice, especially in one where the US is trying to improve relations with the government or is an ally. You could consider the refuelling as a flying the flag mission, where the locals get used to seeing American presence in a non-threatening, economic stimulating way. The fuel dolphin is located out in the water, not directly attached to land, so the most common means of access is boats. The boat that pulled up alongside was very similar to others being used to bring provisions and remove refuse. The fact that it pulled up on the wrong side of the ship seems glaring now, however it was fairly common up to that point as the only direction given to the guys in the service boat is usually "go there, do this" and not direction on where to approach the ship. This has since been modified. After looking at the inside of the hole, both personally and in pictures, I highly doubt a missile would have done the damage. The blast was from the outside in, spread across a larger than a 2' radious would explain. 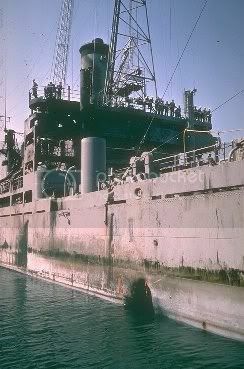 A lot of energy was expended on the outside of the ship, throwing life rafts a considerable distance, spreading dirt and debris all over the topside, and even damaging the flag bag wich is almost midships and several decks up. A missile would have been a more point detonation where areas that were damaged would have been shielded by the structure of the ship. Again, there are indications of a physically large explosive, not more like a point explosive a missile warhead is. Damage inside was considerable, but not well shaped. Instead of lancing through the ship, it was more of a radial explosion. An anti-ship missile would put out more of a shaped cone as the missile would attempt to cut through the ship, damaging as much internally and posible causing the explosion to exit the far side. The missile would also be more likely to be shaped to keep the damage at or close to the waterline as water is the great enemy to a ship after an explosion. Allowing the force to dissipate up and down would simply not get the job done. I believe the attackers thought they could put enough explosives on the small boat to cut the ship in half, and they probably did. However the force was allowed to go any direction it could, wasting a significant amount of energy. You can armchair quarterback this all day and twist it to fit a tin hat conspiracy theory, however that doesn't help fix the problem or get to the real reasons why the attack occurred and prevent this type of thing from happening again. This wasn't a big PR win for anyone in the US, and it wasn't a big enough PR win for AlQaeda, they had to attack the world trade center the next year to get the world's attention. Time USA show Evidence to Back Their Lies? 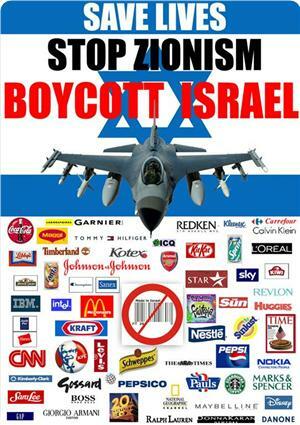 You are not Guilty until Proven and there is no Evidence these alleged hijackers even boarded the planes more Evidence points o Israeli Involvment how fast all these were sent back to Israel by Chertoff Investigate this Action US of Slaves? The savage Zionist Neanderthals doing their best work. Ever wonder why all info on Israeli involvement has been removed from MEDIA THESE GUYS DROVE AROUND IN AZMURAL PAINTED TRUCK Dipicting VERY THING THAT HAPPENED THIS DAY? ISRAELIS WERE IN TRUCKS WITH explosives? 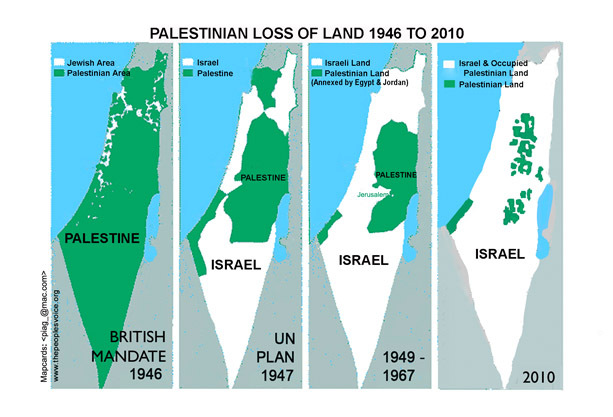 Yet They are returned to Israel? Had these been Muslims the Media would have been all over these People? They possibly would still be incarcerated till today!